Video game movies have always been a tough nut for Hollywood to crack, from the joke that was Super Mario Bros. to the misguided Doom adaptation. Duncan Jones’ Warcraft has long been a wildcard in the great question of whether or not it would be break curse, with the film having a solid creative team but a troubled production history going back nearly a decade. While the film doesn’t quite erase the video game curse, it does go a long way towards legitimizing the genre, and can proudly say that none of its problems are the result of it being based on a game. The story is a loose adaptation of the first two games, which deal with the first meeting and war between the medieval humans and the tribal orcs. However, they must soon work together before both races are destroyed by the orcs’ leader, a warlock whose intentions are far darker than they appear. The plot remains fairly faithful to the source material throughout, incorporating many characters and locations from the franchise’s lore and long history. Warcraft also wisely tries to focus as much on the orcs as it does the humans, echoing the source material’s commitment to showing both sides of the conflict. However, that proves to be a double-edged sword, as the film constantly jumps from one location to the next, and its large cast means only a handful of characters get enough screen time to properly acquaint the viewer with them. The film’s method of throwing you straight into the action isn’t an issue for fans of the series, but newcomers may find the barrage of names and locations to be confusing. The orc characters, Durtan in particular, prove to be the most interesting part of the film, telling a heartfelt story of survival and family. The human characters fare less well, with human King Llane, and his court going through a more generic plotline of defending their homeland. Throughout it all, Warcraft maintains a lightning fast pace, keeping the story moving and building out its world. World building is definitely a big part of the film, as it shows off many aspects and parts of the Warcraft universe not only for fan service, but likely for future sequels. It’s great to see the film so confidently embracing its roots, but with a two-hour runtime, it’s easy to wish Jones & Co. had built up the more essential elements and focused on the task at hand. 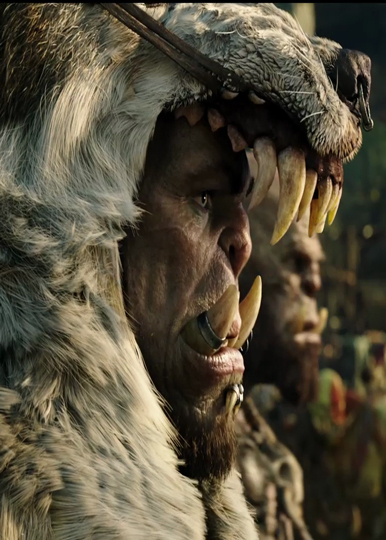 The film shines on the production side, with the CGI on the film’s orcs impressing most. The environments are also something to behold. Any fan of the games will see the world brought to vivid life, from the dense trees of Elwynn Forest to the charred grounds of Blackrock Mountain. The attention to detail is appreciated, and the filmmakers do a fairly good job of translating the series’ more exaggerated, cartoon-y art style into something that works on film. It’s actually the film’s human actors who look out of place, occasionally looking more like high-budget cosplayers than Lords of a vast kingdom. Warcraft is an interesting film to analyze; it faithfully recreates its source material but has the issue of trying to cram in too much. Legendary Pictures clearly has franchise plans for it, and the film rushes to set up the pieces for future films instead of building its world out in a more calculated, meaningful way. Duncan Jones, who directed the superb Source Code, is obviously a fan of the world and has a pretty great vision for it. Unfortunately the film plays out more like an entire season of Game of Thrones crammed into two hours. Thrones is still an enjoyable ride, but the foundation of the story is hidden to those who didn’t read the books. Will ‘Warcraft’ break the games-to-film curse? Tweet me @MaxMielecki. Also, be sure to follow us @YouNerded.